I remember the great excitement for hydros in the early 1950s, and perhaps earlier. But now I have forgotten where many of the races were held - aside from those on Lake Washington and on the Columbia River at Kennewick. This, I think, is neither of those. In this light the inefficiency or distortions of Horace's lens - or one of them - is evident. I have always been fascinated by the hydroplane racing boat – Slo Mo Shun. 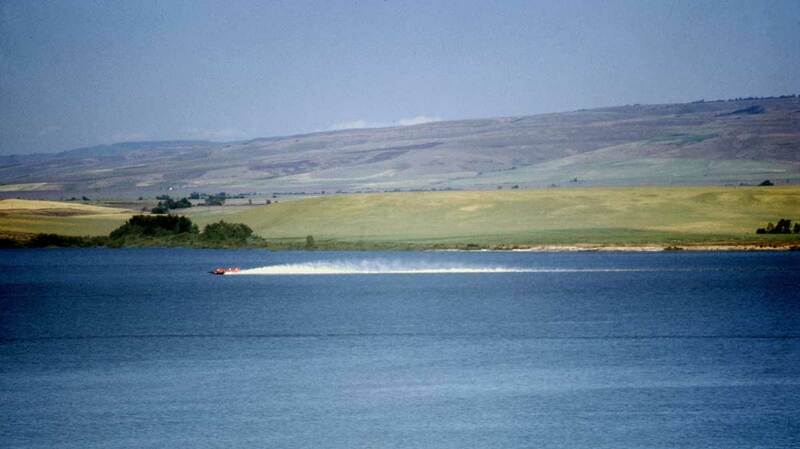 I got to see it perform at a special showing at McKay reservoir (near Pendleton Oregon) around 1950. Honest to God…this picture looks like it could have been taken there!!! It does look like the IV with a mahogany deck, square behind the sponsons, red cowling and fin with SYC burgee. A photo of the IV running anywhere other than Lake Washington or the Detroit river is a rare, rare thing. Stan Sayers was from Pendleton, Oregon and first raced on Lake McKay. Taking the world record holding, Gold Cup and Harmsworth champion Slo-Mo-Shun IV home to Pendleton would have been an enjoyable personal victory lap for Stan Sayers. Has Dave Williams at the Hydroplane and Raceboat Museum seen this photo? The Hydroplane History Facebook page hosted by hydroplane historian/archivist Leslie Field has recently posted pictures of this event and the cover of a souvenir program that was sold in conjunction with the exhibition. The program cover establishes that the Slo-mo-shun IV came to Pendleton on June 17,1951 as part of the Pendleton Water Rodeo. According to one of Mr. Field, the Slo-mo-shun V also performed an exhibition on Lake McKay. Do you have any more pictures of this event?